A $200.00 non-refundable registration fee is due at the time of enrollment. Classes will have a maximum of 14 or 16 children and 2 teachers. 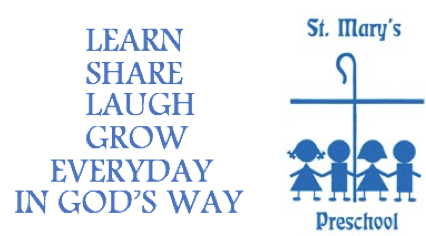 Hours for all classes are 9:15 a.m. to 12:15 p.m. An extended day option is offered for the Pre-Kindergarten class. Children enrolled for the extended day would remain until 2:30 p.m.
Time: 9:15 to 12:15 p.m.
Time: 9:15 a.m. to 12:15 p.m.
Time: Morning only option: 9:15 a.m. to 12:15 p.m.
Extended day option: 9:15 a.m. to 2:30 p.m. The first month’s tuition is due on May 1 or at the time of enrollment. Subsequent payments are due one month in advance, September through April. The cost of all field trips, snacks, screenings, a school bag, and a school t-shirt is included in the registration fee.